This month’s HR Brief discusses the value of emotional intelligence in leaders, explains the importance of diversity training and provides an overview of the GDPR. This month’s HR Brief explains summer dress code policies, highlights the second health savings account limit change of 2018 and discusses Generation Z’s entrance into the workplace. This HR Brief reviews the DOL’s new wage and hour pilot program, discusses how education benefits can help retain talent and identifies potential signs of stress. This month’s HR Brief explains compensable time, highlights a new phishing scam impacting HR professionals and employees, and discusses voluntary employee turnover. This month’s HR Brief provides an overview of the opioid epidemic and what HR managers can do to combat opioids in the workplace, offers four flu prevention tips and highlights the severe skills shortage affecting many U.S. industries. This month’s HR Brief provides an overview of blockchain technology and how it can be used for HR, lists four things employees can do to improve cyber security and discusses the prevalence of work-related stress in the United States. 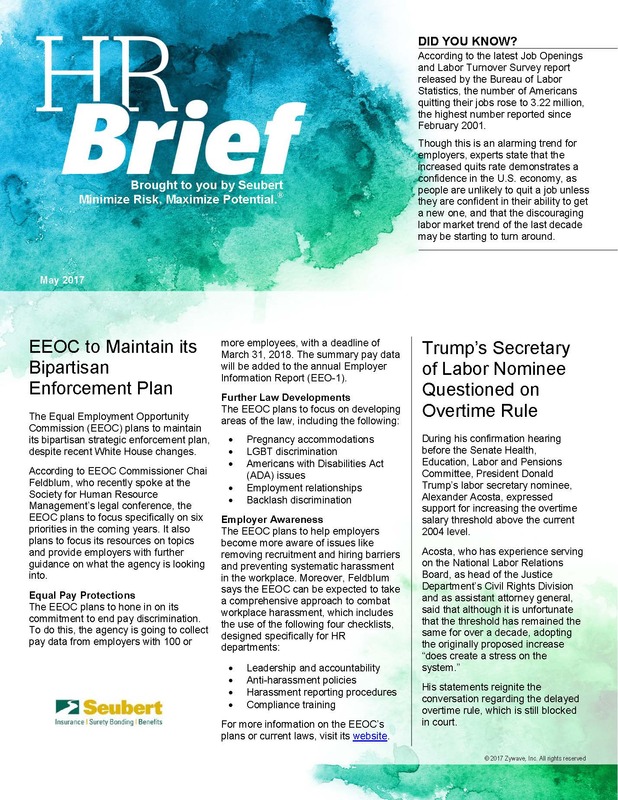 This month’s HR Brief discusses the EEOC Public Portal for harassment claims, the potential effects of the latest tax overhaul and the eagerness of employees to leave their current jobs. 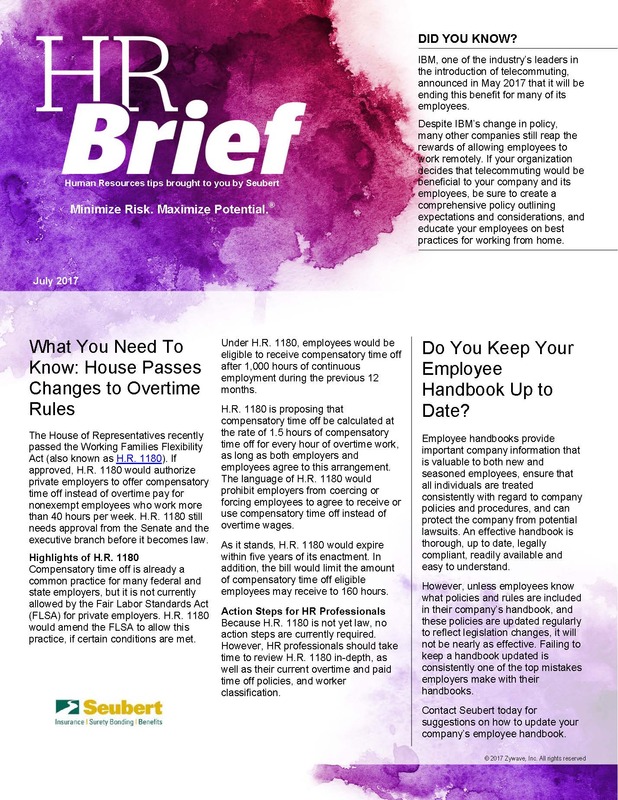 This month’s HR Brief covers updates to the DOL overtime rule, examines the nation’s effort to combat opioids and discusses new 2018 limits for retirement plans. This month's HR Brief provides suggestions for how your organization can prepare for flu season, explains how voluntary benefits can aid your recruiting and retention efforts, and addresses the decreasing popularity of annual performance reviews. 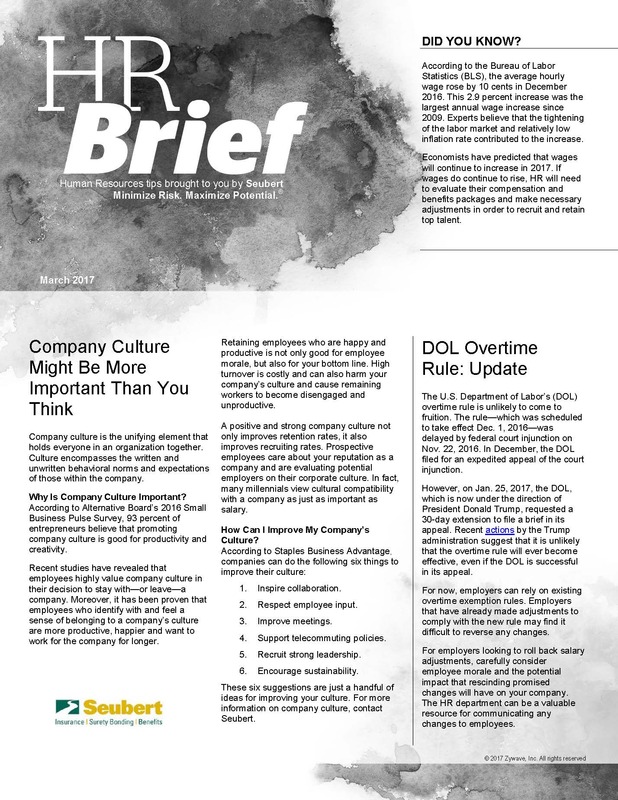 This month’s HR Brief examines the defeat of the DOL overtime rule, offers tips to avoid disaster relief scams and highlights benefits employees say they would leave their employers to have. This month's HR Brief looks at the new Form I-9 requirements, explores the difficulty of filling jobs in the United States and recounts the failed Affordable Care Act repeal. This month's HR Brief discusses the importance of becoming a good listener, explains what "competitive pay" really means and briefly covers proactive cyber security strategies. The HR Brief is a monthly newsletter that features two short, easy to read, hot human resource topics along with a "Did You Know" factoid. These condensed newsletters are perfect for giving an overview of the topics at hand, as well as additional links to find more useful information. If you like these newsletters, be sure to check out our Benefits Buzz as well!